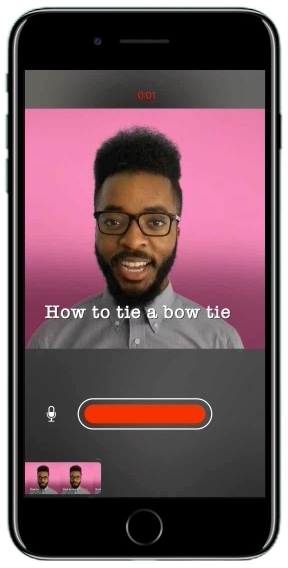 It looks like this app will create ‘open captions’ using iOS’s speech recognition. Open captions are captions which are ‘burned’ into the video, which would be a great for adding captions to videos on Twitter. Twitter currently has no Closed Caption api to add, or display closed captions in videos embedded in tweets. (Note – video above has no audio). So Clips could be good for embedding open captioned videos to tweets, making them more accessible to deaf and hard of hearing. This would have been great for Vine. RIP. This feature will also upload clips to Twitter, FaceBook, Youtube and Instagram, and requires iOS 10.3, which will be coming soon as well. More on the Clips App from Apple. N.B – ‘open captions’ can’t be turned off, they’re ‘burned’ into the video frames of videos, whereas ‘closed captions’ can be turned on or off. 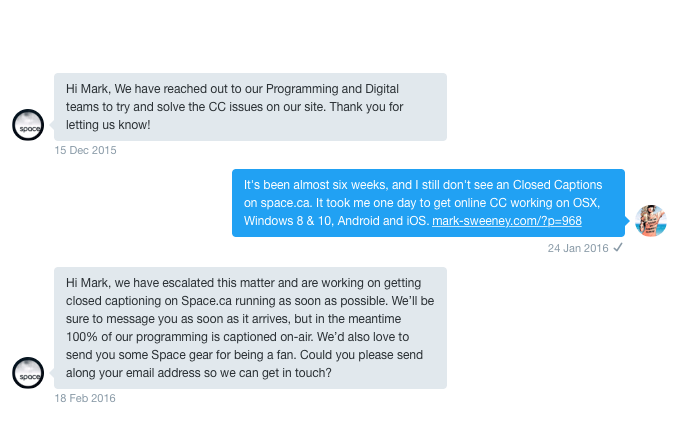 That’s how long has Space Channel has been “Working on Closed Captions” for tv shows like ‘The Expanse’ on their website.